The Old Market Library is built in a 100-year-old market building. The section for the library measures 3×9 metres internally, with a back yard facing a small canal. The roof and the walls were in very poor condition, and consequently any new element had to be self-supporting. 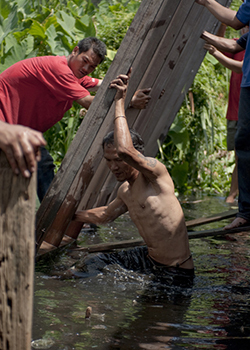 One of the main challenges for the community is the annual flooding during the rainy season. In this period the water can raise to around 50cm above floor level. Retaining the water would be very challenging and the solution was to elevate the calmer zones above the maximum flood level. This ensured that the library was usable throughout the flooded period. Because of the height of the ceiling in the main room, there was an opportunity to construct an intimate loft space. The library is divided into two zones along its length; one side lets you move through the building along the bookshelves, while the other side is for reading and other passive activities. Beyond the main room is a smaller space, the study. An old toilet in the corner was removed and has become a home for a small tree, which hopefully will have good fertilization in the years to come. In the back yard a pergola was constructed to protect against the blazing sun. In this project it was important for us to use local and reused materials, which were already available to the community. 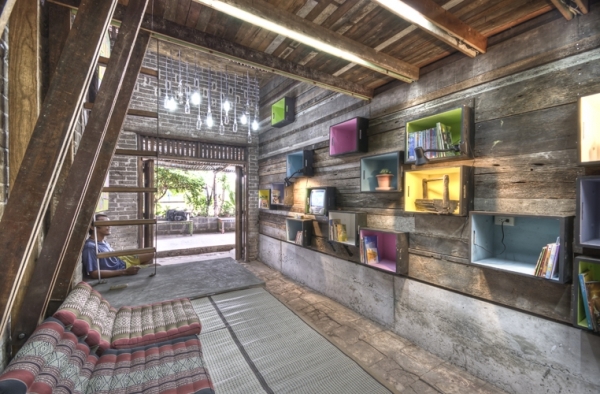 The bookshelves are made of wooden boxes from one of CASE’s earlier projects, while the cladding was assembled using old and decayed wooden pieces found in the immediate surroundings. The internal structure demanded a higher quality wood that had to be trusted to take the specific loads and span certain distances. These materials were bought at the local second hand wood shop. The commercial centre of the Min Buri Market had already moved across the canal due to a fire in the late nineties. As the years have past by the community has diminished from a lively origo into an almost slum-like area. The land rights are uncertain and partly because of this the inhabitants are reluctant to invest in their homes. For this project to be successful it was important to involve the inhabitants actively throughout the whole process, from inception to completion. Initially we mapped the needs within the community by holding regular meetings. 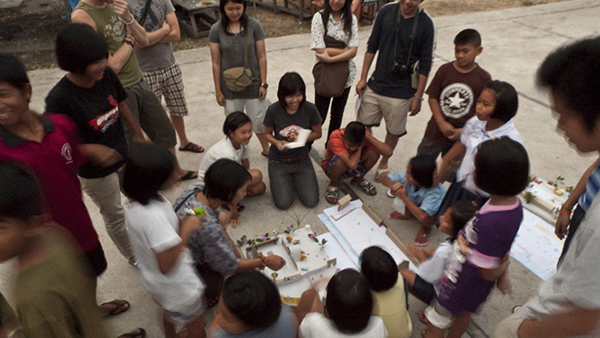 These meeting ranged from drawing and building models, to even clearing garbage. As part of a survey we interviewed people in the area about their views on the community, its past, present and future. Aside from introducing ourselves to the community we wanted a deeper understanding of the situation that they lived in. It wasn’t always easy getting everyone involved, especially the adults. However when the project became more tangible this completely changed. We soon had a regular group that worked with us every day. They began to develop an attachment to the library, a sense of achievement and pride; something we feel was a premise for the library to function in the long term. For TYIN, this project wasn’t only about the refurbishment of the old Market Library; it was also to strengthen the passion in the neighbourhood. The refurbishment was a demonstration of what can be achieved by the inhabitants themselves, through own initiative, using local inexpensive materials and their own knowledge.